Usually, I’d start off a review like this saying how much I was looking forward to this issue. 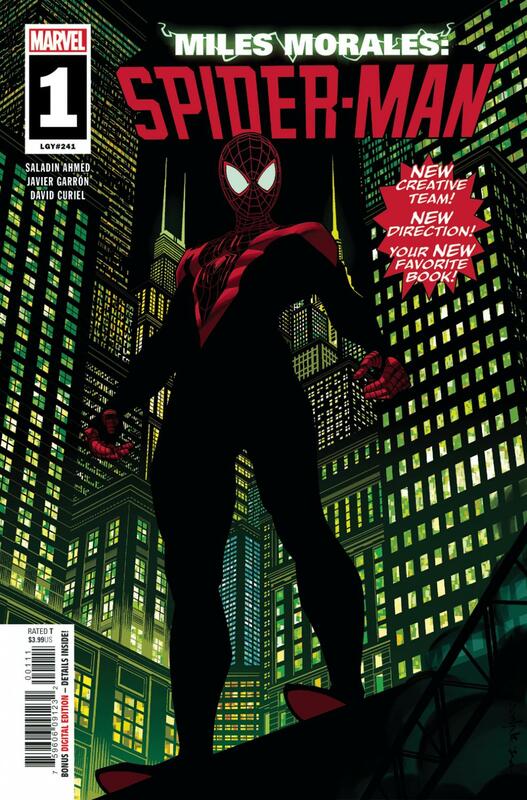 Miles Morales in a new series with a new writer. That’s kind of a big deal. Sadly, I wasn’t a big fan of Saladin Ahmed’s Amazing Spider-Man Annual a few months back (although I think I was the minority on that one), so I was actually a little worried for this one. My problems with that issue are, thankfully, either improved or just nowhere to be found in Miles Morales: Spider-Man #1. This relaunch for the character is pretty expository, to no one’s surprise. When I said that some of my issue’s with Ahmed’s Spider-Man were only improved, I mostly meant the dialogue. Miles’s journal entry that serves as a catch-up for those new to the character feels just a little clunky and cliché in phrasing, but it’s still a whole lot better than what there was before. And really, that’s just a drop in the pond. The rest is otherwise totally believable. One of my favorite things about this series’ new direction is the direction that Ahmed seems to have in mind for characters and threads that were previously aimless or outright uninteresting. Remember Barbara? You just might now. The “big bad” of this issue’s appearance didn’t quite work for me, but that’s mostly because of the trope of people just needing to explain themselves in order to avoid a fight. Also noteworthy is the pacing. People like me who have been waiting for a good Miles book will be happy with how quickly the ball got rolling here, especially compared to before. Javier Garron delivers some pretty solid work here, but the whole is made a lot better by David Curiel’s coloring. Garron nails all your normal facial expressions, but his Spidey eyes can really take me out of it. They’re almost rectangles sometimes. But back to the non-costumed people, he gives them all something unique that tells you a good bit about their personality at a glance. Movement doesn’t really make sense sometimes, which is a shame when after images should make it easy to follow, but Miles’s venom sting and webbing are much more visually engaging here. Lightning that orbits the victim is always a better look than tiny little sparks coming off. Again, Curiel’s coloring is just another fitting of the thematic fresh air that this relaunch is. This character has previously been cast in such a downer light. That can of course be appropriate sometimes, but it’s nice for things to feel so upbeat again. The lighting can be a little weird; a nighttime fight suddenly looks like it’s in the day, but it’s still pleasant to look at.